Kingman, Arizona—An unidentified 63-year-old man was flown to University Medical Center in Las Vegas with serious head injuries after the Hummer H3 he was driving was sandwiched between other vehicles in an accident on Tuesday afternoon. The accident occurred at the intersection of Andy Devine and Airway Avenues. Kingman Police Department accident investigators report that Kathleen Ann Cahoon, age 68 of Kingman, was driving a silver Hyundai SUV westbound on Andy Devine Avenue. 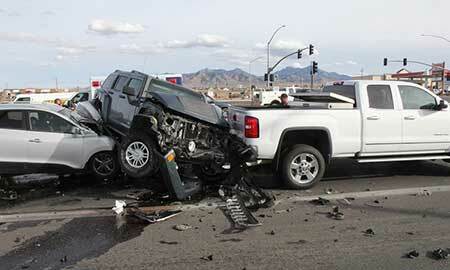 Her vehicle slammed full-speed into the Hummer that was stopped in a line of vehicles at a red light at Airway Avenue. The force of the collision pushed the Hummer into the back of a white GMC pickup which, in turn, was pushed into the back of another truck. The truck that was first in line left the scene before police arrived. Ms. Cahoon sustained minor injuries. The driver of the Hummer remains hospitalized. The investigation is ongoing. We wish continued improvement for the injured man.